So everyone could use this information to build/buy a good computer for CO workflow. I suggest to improve this bench with fixed set of RAW files, so the collected bench data would be more accurate: it will depend mostly on computer specification (CPU and GPU first), but not on RAW files type (Canon, Nikon, Sony and all other RAW types affect export speed). 50 photos made with Canon 5D mk3, size about 1.3GB. 3. Open RAW files that were downloaded on step 1 and wait until they are fully imported (previews are built by CO). It is very important to set up export with theese parameters! Otherwise the bench results won't be reliable! 5. Make the first export (GPU accelerated) noting the duration of this process. At least one export process is needed. However it would be great if you'll be able to make it 2 or 3 times, because results may vary depending on HDD caching, computer backround processes and others. Take the shortest time duration - it is the first bench result. 6. Disable GPU acceleration: menu Edit - Preferences - General tab - Hardware acceleration - Processing set to Never. Restart the CO.
7. Make the second export (no GPU acceleration) in a similar way as in step 5. That will be the second bench result. Here is a myself-written Windows utility that will help to easily calculate benchmark results: it analyzes all files in selected folder and automatically calculates time span between opening of first file for writing and last file modifying. Here you can see all collected benches in user-friendly spreadsheet format (thanks to WPNL) . Suggestions for benchmark improvements are very welcomed! The only goal of this thread is to help each other with selecting hardware components for best CO workflow experience. Last edited by garrison on Fri Apr 27, 2018 7:25 am, edited 10 times in total. The GPU speed up factor is about 2.89x. The GPU speed up factor is about 4.68x. Last edited by garrison on Mon Feb 05, 2018 6:20 pm, edited 6 times in total. For each scenario I ran it with the session first on my NVME, SSD, old mechanical drive and then a 12GB RAM drive. I always saved the files to the same disk the raws were on. I also did a test with a single 1080ti as well as with both. I can see both GPUs being used by Capture One but it seems to alternate between them hence why there is basically no improvement. I suspect even with the single GPU I am Severely CPU limited. Although during test CPU usage sits under 50%. 1. Disk speed almost does not affect overall time result. 2. GPU SLI mode advantages are not used by C1 to speed up conversion. Or very fast GPU needs proper CPU speed to unleash all its power. 3. CPU with higher single core speed is needed to take more processing power from the fast GPU (maybe I'm wrong). I can't explain that except internal C1 limitations that prevent using all power speed from CPU and GPU. Maybe C1 team expert could help us understad theese results. Last edited by garrison on Wed Jan 17, 2018 11:08 pm, edited 1 time in total. The GPU speed up factor is about 3.64x. Last edited by garrison on Wed Jan 31, 2018 5:14 pm, edited 5 times in total. I was at the mercy of my budget when I built this computer, and I believe my GPU is bottlenecking my CPU in a big way. I'd like to see what this system would do with a 1080ti. Would also like to see what this system would do with an NVMe M.2 SSD for my active jobs. At the time I built this workstation, I had a choice between the 7820x for $375, and the 8700K for $415 USD on Black Friday. I went with the 7820x. What I especially love about this build, is how smooth and responsive everything is. The adjustment sliders a butter, with zero lag. I can run a massive export, and a large photoshop batch, go back and start making RAW adjustments to a third job, and this computer doesn't break a sweat. Still silky smooth and responsive. The GPU speed up factor is about 1.05x. Last edited by garrison on Wed Jan 31, 2018 5:15 pm, edited 4 times in total. The GPU speed up factor is about 1.02x. Just a little bit faster CPU with the same GPU as in previous bench. It seems like the GPU almost doesn't improve performance with this CPU. Last edited by garrison on Wed Jan 31, 2018 5:15 pm, edited 1 time in total. GPU - EVGA 1080 FTW also O.C. also again same things running PS etc..
Last edited by Chad Dahlquist on Mon Jan 29, 2018 6:50 pm, edited 5 times in total. Compressing to jpg seems to be a single core operation (I think I've read this somewhere in this forum) as it uses the JPG functions from Microsoft. This means first the GPU is converting the raw picture and then only the CPU saves the jpg. At this time the GPU is idle until the next raw file is done. As the AMD Ryzen processor is not as fast in single core operations as Intel it will take a bit more time to store the jpg. Some time ago I've had an idea to improve the speed! 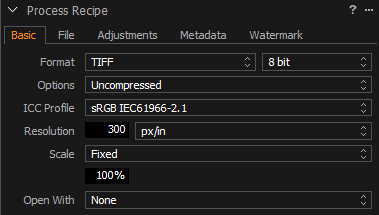 I'm using a small program made by myself to convert the TIF to JPG with the "open with" operation. (keeping meta data) and then erases the TIF file. In my opinion this is also the reason why two fast GPU cards do not show much performance differences. Therefore the times for TiF would be also very interessting for other CPU/GPU combinations. The GPU and NVMe drive is clearly bottle necking my system. I'll be looking to upgrade to a 1080ti and NVMe later this year when I have a more $$$. For now I'm good to go. Less than a second difference between working on a 7.200RPM HDD (150 Mb/s) vs RAID0 SSD (1.000 Mb/s). Last edited by WPNL on Thu Jan 25, 2018 10:28 pm, edited 1 time in total. StephanR wrote: Some time ago I've had an idea to improve the speed! This is a great solution but it simply tells me that Phase One can do a much better job at utilizing available resources (you're parallel tasking where Capture ONE should be). I'd give this information to Phase in a technical support case and hope it lands on good ears..